One of Australia’s oldest and largest mutual banks has implemented a creative solution to master the simple, yet often overlooked concept of a “well done” according to Chief People Officer, Darren Stephens and Human Resource Manager, Margo Dewar. Ranging from digital e-cards to annual awards nights, Heritage Bank’s tiered worker recognition program, “Heritage Heroes” aims to recognise, and pay tribute to workers excelling in their role and going beyond the call of duty. Heritage Bank has utilised innovative technology to allow employees to instantly send each other e-cards from their mobile devices when they see one of their colleagues going above and beyond. Employees receive an icon token for exemplifying a company value, be it customer service, passion or courage. Once you receive an icon token, you are considered a Heritage Hero. Token recipients can be seen on an updated feed on the Heritage Bank intranet page which makes it easy for employees to celebrate their colleagues. Each quarter, employees nominate each other for awards presented at a recognition ceremony. Winners are decided by a committee. The annual platinum awards night recognises high-performing Heritage Heroes at a black-tie event. Board members are in attendance and the CEO hosts the event, allowing the top hierarchy to express their gratitude. Using a digital platform, the program has been rolled out across the organisation, to all 800 employees, to recognise those who do more than just their day job and demonstrate exemplary employee performance. 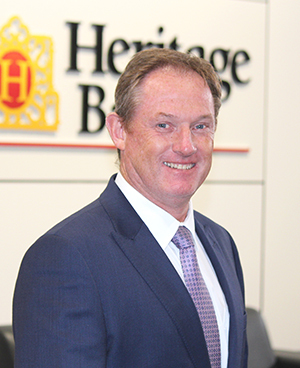 Darren Stephens, Chief People Officer at Heritage Bank said the culture at Heritage Bank was driven by the organisation’s core value to put people first and that presentations of tokens and letters of congratulations were made in a public setting. “Engagement must be genuine, as employees can easily spot insincerity or superficial recognition,” he said. “The program excels at building authentic and positive team culture because appreciation is not orchestrated. We want the program to be easy for people to participate in, but it also needs to be worthy. Previously, recognition programs at Heritage Bank were administered through each separate team, however the bank saw an opportunity to improve its recognition program after it underwent changes to its values and strategy. “The new values and new strategy were our call to action. We formed an organisation-wide recognition program that combined programs that were piecemeal into something that captured and celebrated workers on a regular basis,” said Ms Dewar. The program applies to the whole workforce right through customer service roles to executive management, and has been championed from the top from the beginning. “The new CEO Peter Lock, drove the consolidation of Heritage Heroes into one program,” said Ms Dewar. “The positive tone of the executive is a big contributor; the CEO is a zealot for this type of program and role models it and demonstrates it,” said Mr Stephens. Mr Stephens said that the program has been a success across the organisation. Only half (52%) of high-performing workers say they receive praise and recognition at work? (2016 Snapshot of the Australian Workplace).